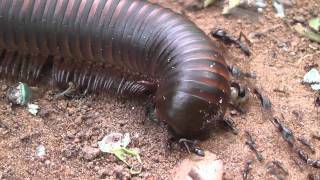 this Millipede Is Trying To Cross An Ant Highway Made By Driver Ants. Unfortunately, The Ants Are Not Happy About That And Bite Him Until He Changes Course. Millipede Trying To Cross Ant Highway. Total Views 45852. WTF! Russian Driver Merging Onto Highway Pulls His Gun Out The Window! Total Views 41852.